Standard - $40.99 Only 6 left! Everyone has their favorite winter accessory, sometimes it's a great pair of mittens, sometimes it's a super fun hat. Whether he was fighting Daleks or solving humanity's problems the fourth Doctor always had his absurdly long scarf with him. You can't blame him for becoming so enamored with his knitted neckwear. According to the Doctor, it was made by Madame Nostradamus, that "witty little knitter". Somewhere along the line, we've all experienced the tragic end of our favorite winter gear: one of the lovely mittens gets dropped somewhere in the snow covered streets, a wool cap gets thrown in the dryer only to come out the perfect size for your garden gnome. The Doctor's experience is no different, when his scarf got caught and irreparably damaged in the midst of one of his epic adventures. 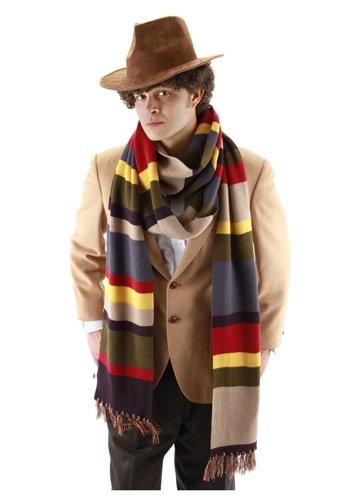 At the time of the damage, the Doctor lamented that his scarf was irreplaceable. If he's still interested, we might have something to make him feel better. This colorful accessory fits perfectly with the Time Lord's personality. Now that he has it back in his possession he can get back to saving the universe in style.